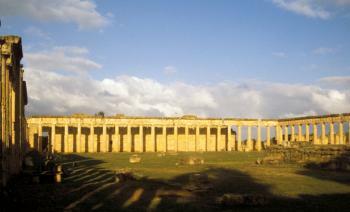 The Archaeological Site of Cyrene represents a Greek colony that was one of the principal cities in the Hellenic world. It was founded in 630 BC by Greeks from Thera (Santorini). From 74 B.C. it went on to prosper as a Roman province. There are also other ruins, such as a partially unexcavated Temple to Zeus and a large necropolis approximately 10 km between Cyrene and its ancient port of Apollonia. The rediscovery of its ruins in 1705-1706 has been very influential on the development of Neoclassicism. Its really real adventure when u travel beyond the seas to see such magnificent city as Cyrene city in Libya which's one of the old city in the world . And as libyan citizen i haven;t had the chance to see this an archaeological site but one day i must make this long journey all the way to that part of the world and inspire my self with such thing. I recommand every one to get the chance and go out there and discover this spectacular place and assure all of you will be so impressed with warm reception by libyan people and u will enjoy your stay out there. so folks go for it and you would never regret this jorney. Although only the ancient Greek city of Cyrene has been inscribed by UNESCO it exists as a pair with Apollonia, its port situated some 15 kms away down from the hills (though that is certainly less interesting or impressive). Its hillside location helps give Cyrene a very pleasant situation. It is spread out over several levels and a walk down from the top gives attractive views both of what you are about to see and all the way down to the sea. You can read guide books on the details of the sights – it is very spread out and you could spend a long time wandering. The attached photo is of the “Forum of Proculus”. Looking back on it, our visit to Cyrene was perhaps carried out in a spirit of “travel duty” without any great enthusiasm or wonderful memories having been generated! It is an important and “world famous” site which one feels one ought to visit. In all honesty however it is the never ending roadside pictures of Gaddafi as General, as Arab Chieftan, as “Father” of the Children of Libya, as conceiver of the “Great Man Made River” …… etc etc etc which I remember most from our stay in the nearby town of Al-Bayda and our drives around the Jebel Akhdar!! Oh, and an interesting little nearby Byzantine church at Gasr Libya with a magnificent set of 42 6th century mosaics (no photography allowed unfortunately). You will have to make your own decision on how much you want to see Cyrene! Restored by anastylosis: Wiki: "ongoing emergency conservation on a theater inside the Sanctuary of Apollo through the process of anastylosis"
Pentapolis: The Western part of Cyrenaica as colonised by the Greeks from c 600BC "comprising five cities, hence known as the Pentapolis: Cyrene .. with its port of Apollonia (Marsa Susa), Arsinoe or Taucheira (Tocra), Euseperides or Berenice (near modern Benghazi), Balagrae (Bayda) and Barce(Mari) ... of which the chief was the eponymous Cyrene. 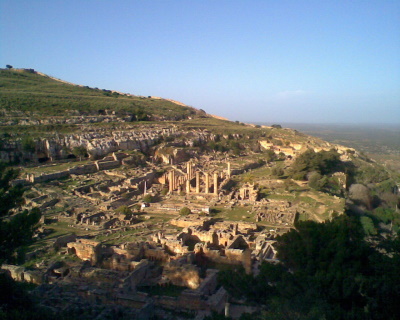 The term "Pentapolis" continued to be used as a synonym for Cyrenaica" (Wiki). From 296, when Diocletian reorganised Cyrenaica into 2 provinces one, containing Cyrene, was called "Libia Pentapolis"
Mentioned by Pliny the Elder: Chapter 6: Libya Mareotis; "it is 525 miles by land from Cyrene to Alexandria"